A social worker by training and a “cake lady” at heart, Jodi Rhoden combines her love of baking with her determination to help people. 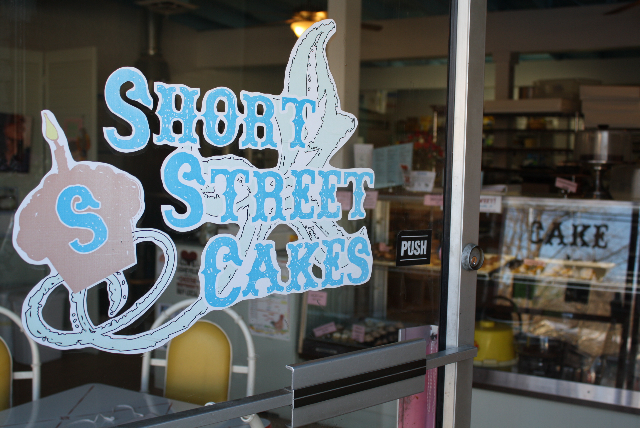 Certain women identify as Cake Ladies, and she is one of them, says Jodi Rhoden of Short Street Cakes. Jodi Rhoden identifies as a cake lady. Make that Cake Lady, capitalized. There are certain women, she contends, who find a profound sense of purpose in making cakes. 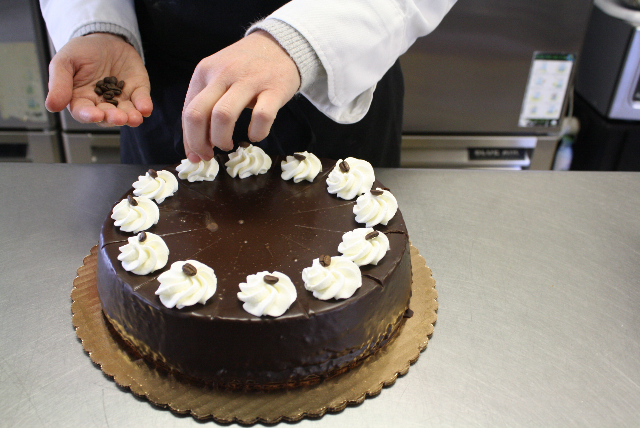 Whether as professional bakers filling customer orders, café owners diversifying menus, or homemakers baking for family and friends, they revel in the pursuit of perfect layers and beautiful frosting. Most importantly, they cherish the pleased reactions their edible artwork elicits. Jodi—the founder, owner, and head baker at Short Street Cakes in Asheville, North Carolina—is so taken with this idea that she has written a book, due out later this year, about some of the many Cake Ladies she admires. Using no food coloring to be more natural leads to earth-tone cupcakes. Jodi’s husband, Duncan, painted the sign. Although she learned a few things about baking from her mother and grandmother while growing up in Marietta, Georgia, Jodi became a serious baker through, of all things, her career as a social worker. After earning a social work degree at The University of Georgia, she moved to Boston and was involved in a program to help people get out of poverty by learning job skills. “I took a bakery training course along with them and learned to make artisan breads,” she says. 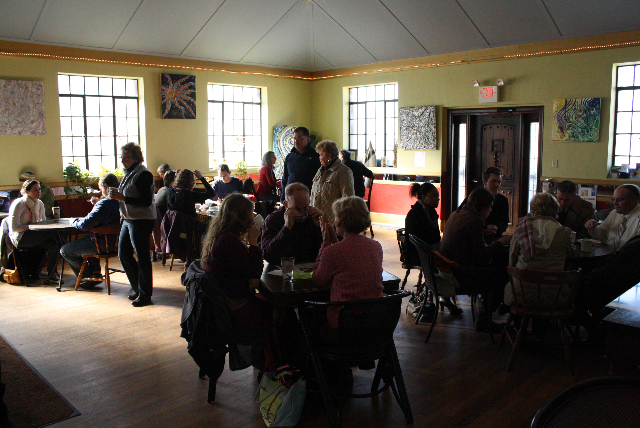 Following two years in Boston she moved to Asheville about 10 years ago to continue doing social work. To make ends meet she waited tables at restaurants and worked at West End Bakery, where she discovered that making cakes suited her personality. There she learned from two of the best: Cathy Cleary, one of the founders of West End Bakery, located about a mile from Jodi’s Short Street Cakes on the same street, Haywood Road in West Asheville, and April Moon, who now runs Sunny Point Café, located between the two bakeries and also on the same street. 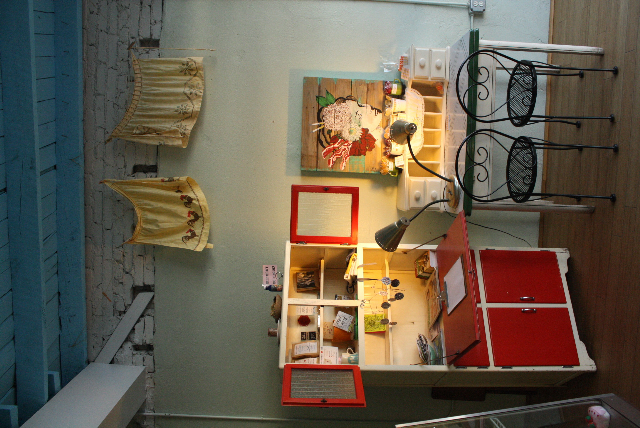 Vintage finds add to the homey setting at Short Street Cakes. 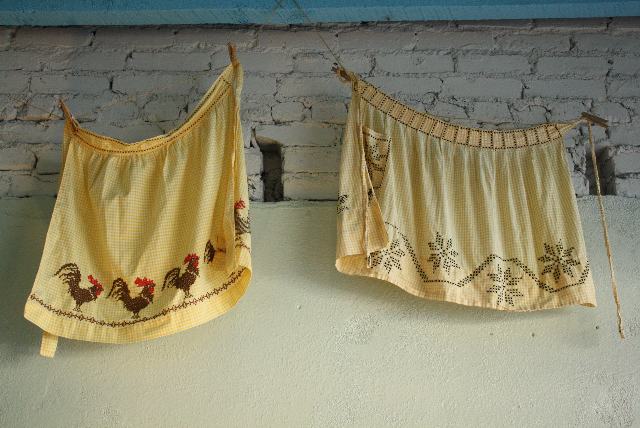 Some of her mom’s old aprons brighten the walls. 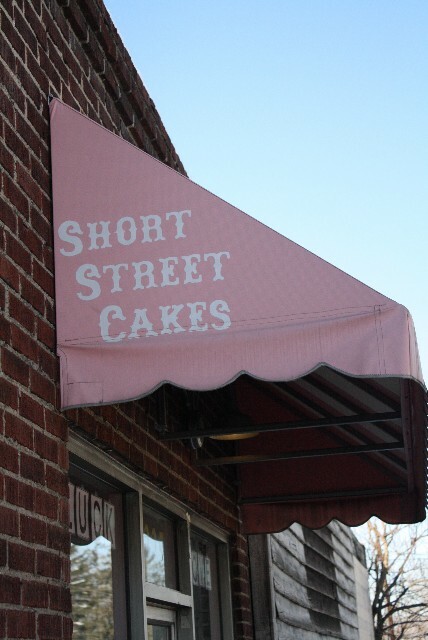 A homey atmosphere permeates Short Street Cakes. Some of Jodi’s mother’s vintage aprons hang on the walls, plus paintings by a friend, artist Hannah Dansie (aka Two of Hearts), who also works there as a baker. 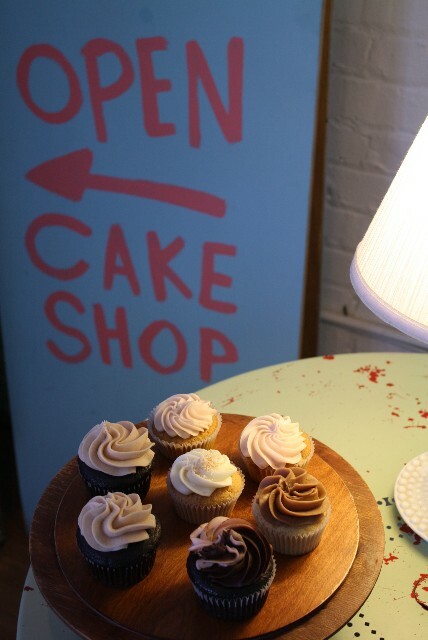 Jodi’s husband, Duncan McFarlane, painted a folk-art-style cake shop sign (see photo). An antique cupboard and salvaged dinette sets grace the place. Wooden and glass cake stands and flea-market-find Milk Glass lamps add to a simple-living setting. 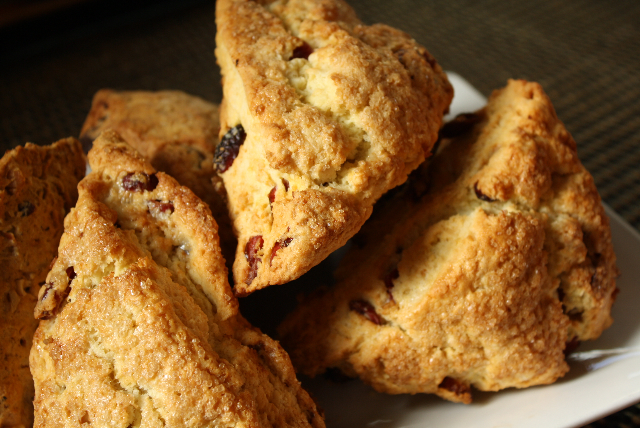 A slogan printed on Short Street’s menus and business cards reads: “Fresh, Natural, from Scratch, with Love.” Jodi is indeed devoted to baking from scratch with all-natural ingredients. Consider the cupcakes. Most cupcake bakeries present a splashy rainbow of colorful icing. Her muted color palette holds mostly earthy shades of dark brown, creamy caramel, and off white. “I don’t use food coloring,” she explains. “Whatever’s in the icing, like chocolate or butter cream, is what you see.” She also uses fresh local ingredients whenever she can: eggs from Mountain Sunshine Farms in Asheville, organic flour from Lindley Mills in nearby Graham, fruit in season from farmers’ markets. 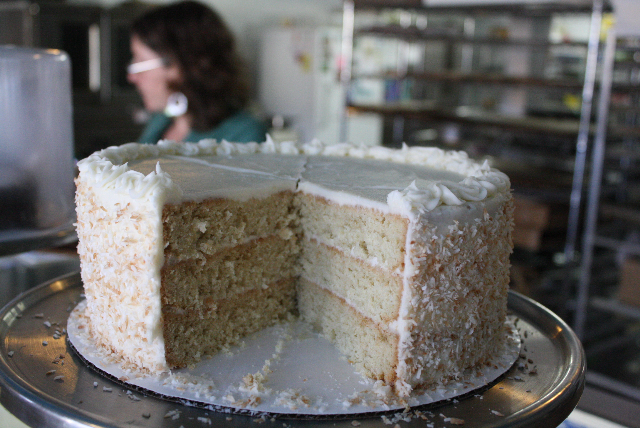 By the slice or whole, coconut cake is Short Street’s bestseller. Cakes are this bakery’s main attractions. Simpler versions include Sour Cream Pound Cake (add almond flavoring by request), Mexican Chocolate Cake (with cinnamon and cayenne), and Ashevelvet Cake (naturally reddish-brown). 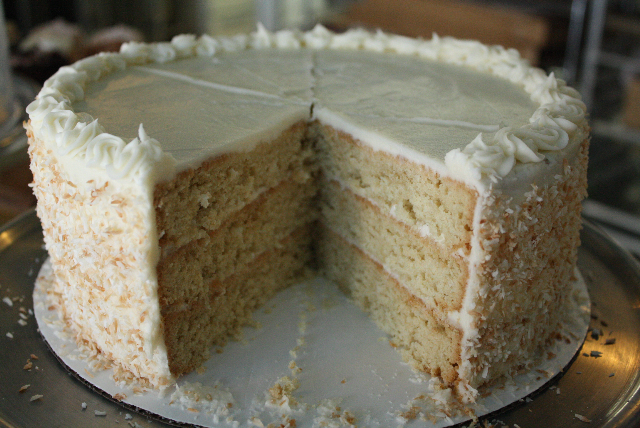 Classic offerings take in Sweet Potato Spice Cake (cinnamon cream cheese icing), Coconut Cake (see photo), Carrot Spice Cake (carrots, raisins, walnuts), and Georgia Hummingbird Cake (pineapple, pecans, strawberries, bananas). Jodi gets creative with deluxe options such as Bacon Apple Cake (pound cake with bacon drippings, fried apples, bacon crumbles), Wedge Brewery Community Porter Cake (chocolate cake with a local brewer’s porter baked in), and Mardi Gras Queen Cake (pineapple butter cake with a bourbon soak and coconut-pecan custard icing). Hungry yet? There’re also Pineapple Upside Down Cake, Flourless Chocolate Gateau, and custom-made birthday and wedding cakes. Artist and baker Hannah Dansie painted this portrait seen at Short Street. 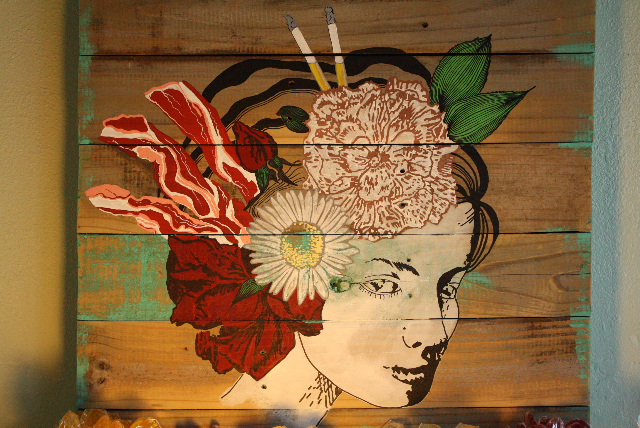 See the bacon and cigarettes in the hair? As for the love part of from scratch, with love, Jodi shows it in a big way through her support of non-profit groups, an extension of her social-worker soul. “I donate cakes to just about any group that asks for them for fundraisers,” she says. “It’s how I’m able to tie my bakery work to my community involvement.” In return she gains loyal customers and plenty of goodwill. She gives cakes to Bountiful Cities, an urban agriculture organization that promotes affordable food for low-income communities (and where she’s on the board). She gives cakes to the YWCA of Asheville, where she’s glad they offer free child-care service for women struggling to hold onto jobs. And to Mountain BizWorks, which helps entrepreneurs launch businesses in under-served communities. And to Our Voice, a women’s crisis center involved with domestic violence and sexual assault issues. And other organizations she believes in. Jodi says her book—working title, Cake Ladies—should be in print later this year from Asheville publisher Lark Crafts, a division of New York-based Sterling Publishing Company. It includes profiles of women who, like Jodi, hail from the South and identify as Cake Ladies, plus some of their recipes. Door’s open, come on in! “I met all these women through providence,” Jodi says. Younger women in business to earn a living. 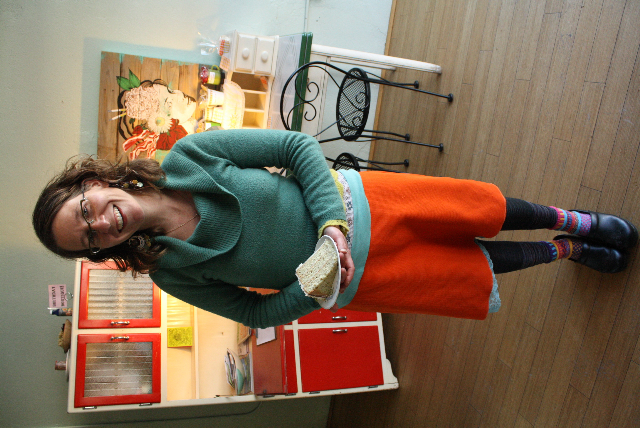 Older women baking at home for family. Women baking everywhere from the Qualla Boundary Cherokee reservation in North Carolina, to her hometown in Georgia, to New Orleans, where her good friend Elyse Manning bakes at New Orleans Cake Café & Bakery. 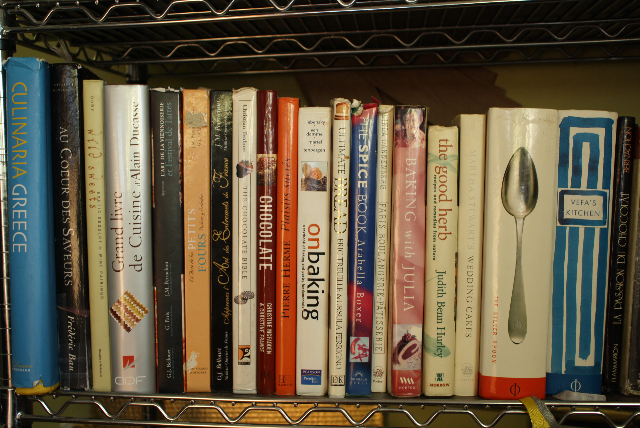 Their stories, she says, are about why they bake as much as what they bake, and about being Cake Ladies. 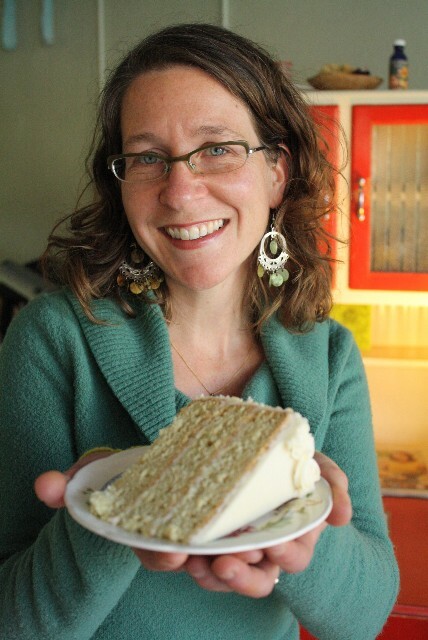 Read Jodi Rhoden’s blog, My Life in Cake, at http://shortstreetcakes.blogspot.com. From I-240 in Asheville take Exit 2, go east on Haywood Road, which in a few blocks veers sharply left, and find Short Street Cakes on the left. That’s Jodi—bright colors, bright smile, bright outlook. Greek treats rule at this combination bakery, café, art gallery and cozy hangout. 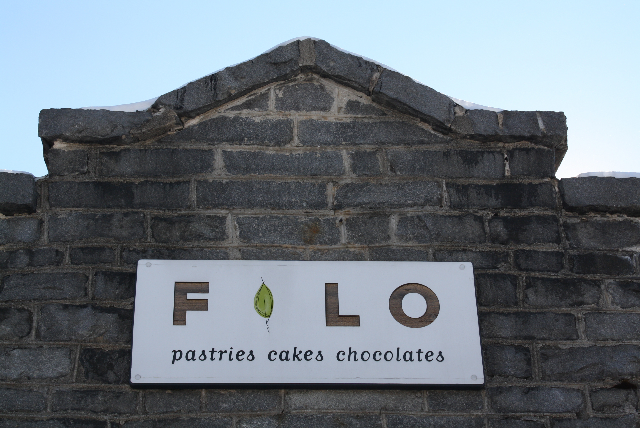 Filo could hardly be more Greek. 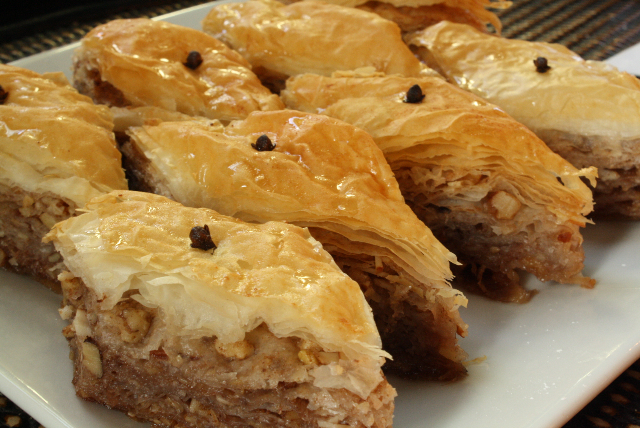 Aromas of fresh-baked spanakopita and baklava waft through the Asheville, North Carolina bakery. The name itself—a variant of phyllo, the multilayered dough stretched into paper-thin sheets for famously flaky Greek pastries—adds a suitable cultural reference. And when the owner introduces herself there’s no doubt, because you won’t find many names more Greek than Maria Papanastasiou. 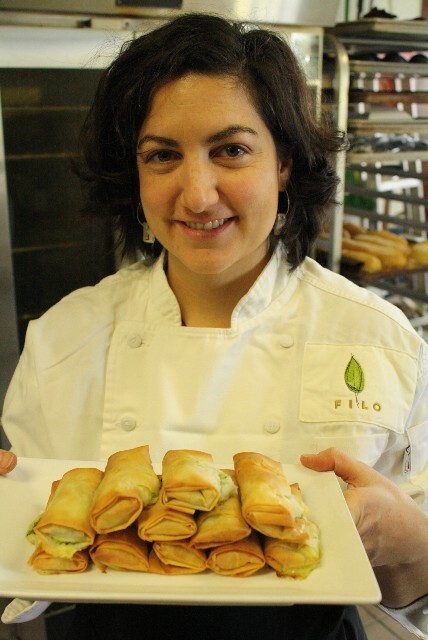 That tasty upbringing and a lot of world traveling to improve upon her inherited culinary talents are Asheville’s gain now that Maria owns and operates Filo as a bakery and café where artwork lines the walls and people linger coffeehouse style. Memories of extended trips at age 8 and 18 to Greece, spending a month on the Greek mainland (her mom’s roots) and a month on the isle of Cyprus (her dad’s homeland) helped solidify Maria’s interest in all things Greek. “Later as an adult I traveled four more times to Greece, four times to France, and once each to Spain, Italy, and Germany to learn about the cuisine,” she says. She completed the pastry program at the prestigious French Culinary Institute in New York and worked for five years in Manhattan restaurants such as Orso Restaurant (Italian), Tabla (Indian-American fusion), and the trendy Lipstick Café. She also arranged a six-week stint in a bakery in Beziers in southeastern France. Showcases teem with goodies, Greek and otherwise. 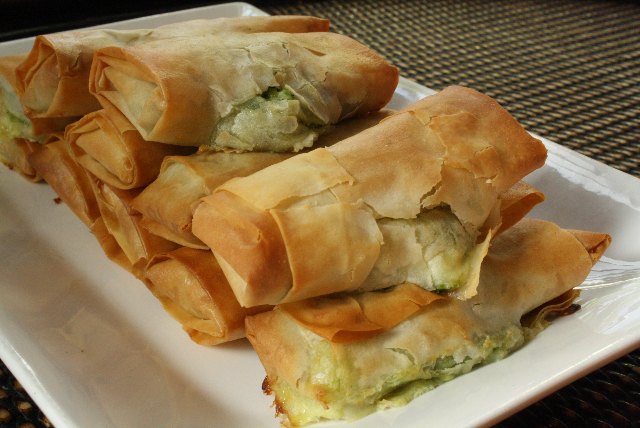 The spanakopita features spinach, feta, and eggs, of course, but also leeks (Maria’s secret ingredient) and Swiss chard when she can pick it fresh from her own vegetable garden or find it at the nearby Black Mountain Farmers Market. 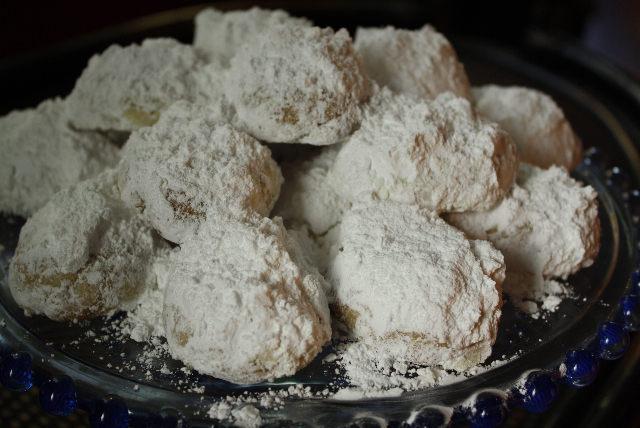 She makes Greek wedding cookies loaded with butter and rolled in powdered sugar. There’s kourabeides (a sweet shortbread); galaktoboureko (baked phyllo layered with custard and baked again); kataifi (shredded phyllo soaked in syrup), and baklava (the classic Greek pastry with layers of phyllo, chopped nuts, honey she buys locally from Haw Creek Honey, and clove dots on top for accent). 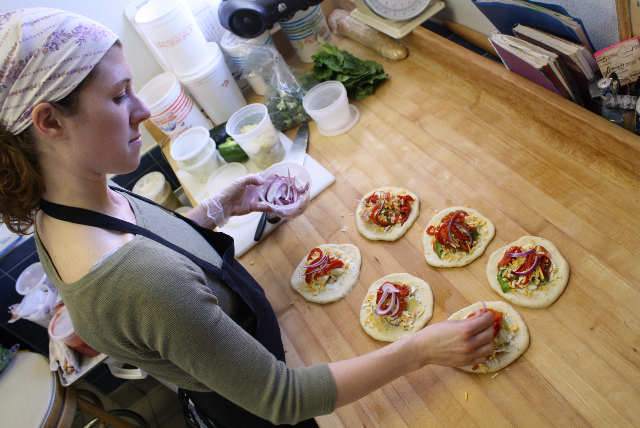 On Tuesdays she makes whole-wheat pita bread to go with her mother’s always-in-demand hummus. 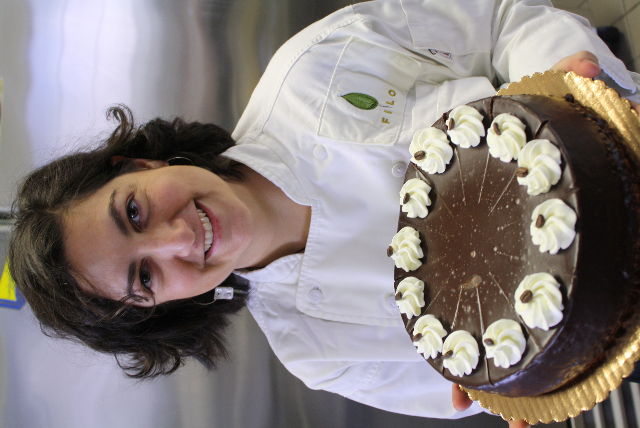 Beyond her signature Greek specialties, Maria also makes excellent flourless mocha tortes, chocolate mousse cakes, blueberry almond cheesecakes, cranberry walnut pies, key lime tarts, a variety of brownies and biscotti, crusty baguettes and more. At lunchtime oven-fresh calzones made with basil-and-rosemary-laced dough folded over roasted red peppers, red onions, mushrooms, artichokes, collard greens, ricotta, and other fresh ingredients create an irresistible aroma. By special order, she even mounts amazing wedding cake projects. WHAT’S THAT? 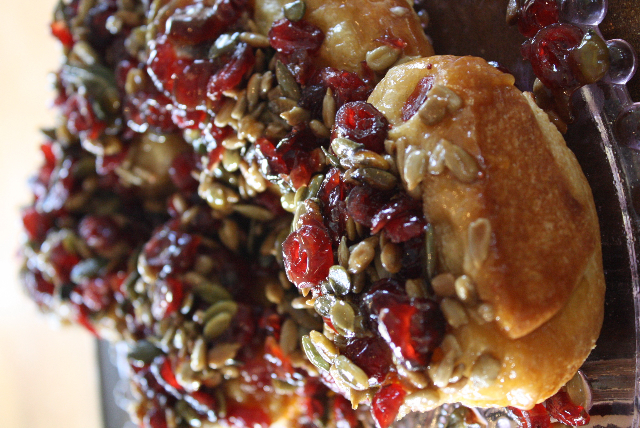 When I visited, Maria’s changes-daily sticky buns came piled high with cranberries and pumpkin seeds or with raisins and walnuts, the bottoms oozing baked butter and sugar. The beignets, denser and chewier than most and with swirling layers inside, took me by surprise. What’s her secret? 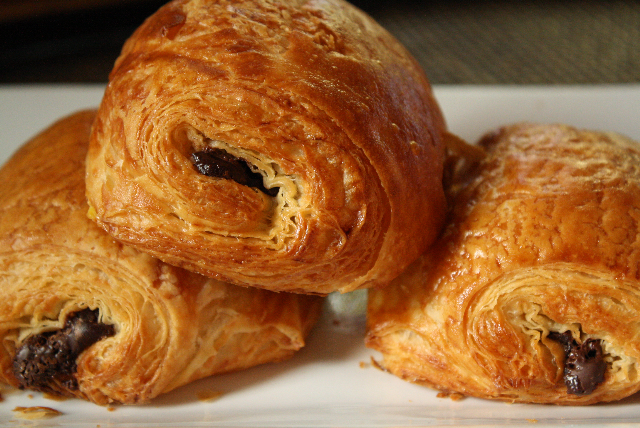 “They’re made from leftover croissant dough, balled up and deep fried and tossed in powdered sugar,” Maria explains. Another innovation, based on something she discovered during a trip to Barcelona, Spain, involves candied spaghetti squash wrapped in croissant dough, deep fried, and rolled in granulated sugar. “Clearly I like dealing with sugar more than with protein,” she says, flashing a mischievous smile. For that, the sweet-toothed say thanks. Monday-Thursday 7 a.m.-8 p.m., Friday 7 a.m.-10 p.m., Saturday 8 a.m.-10 p.m.
From I-40 in East Asheville take Exit 55, go briefly north on Porter Cove Road to a “T” intersection, turn left on Tunnel Road, go west about 1.5 miles (passing the Blue Ridge Parkway) and look for Filo on the left in a stout stone building.